Constance Gladys, Marchioness of Ripon was six feet tall and considered to be a stunner; she was so beautiful that even the most glamorous in her company looked like they needed ‘a touch of the sponge and the duster,’ according to the writer E.F. Benson. Lady Ripon was a close friend of Oscar Wilde, who dedicated his play A Woman of No Importance to her, which just goes to show what a bright spark she was in the first place. Other celebrated friends included the opera singer Nellie Melba, whose success in London was largely due to Lady Ripon’s support. In her younger days, as Lady de Grey, Gladys thought nothing of spending $5,000 on an outfit for a fancy dress ball at Devonshire House. 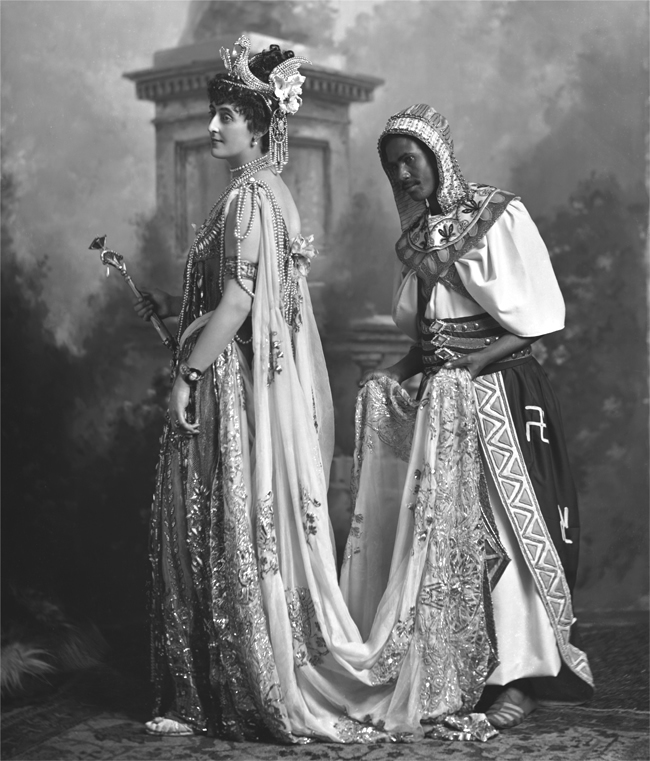 Her Cleopatra costume was made in Paris and it included an elegantly dressed black slave in full attendance when she made her entrance. Her first marriage had been rather horrid; her husband the Earl of Lonsdale, who even by the standards of the day was considered to be sexually incontinent, had died of a heart attack while busily engaged in enjoying his own private brothel. Lady Ripon was hardly a paragon of Edwardian virtue, in her youth she was certainly a very active young woman, but she managed her affairs as discretely as was necessary. She next married the exceedingly rich Marquess of Ripon and was lucky enough to live in the incomparable Studley Royal, a perfect Palladian jewel of a house surrounded by beautiful gardens and with the exquisite ruins of Fountains Abbey in its grounds.But Lady Ripon was a sophisticated individual and preferred not to isolate herself in North Yorkshire with only country sports and the limited topics of horses, dogs and guns for conversation. She set up house at Coombe Court in Kingston so she could be on hand for her pet project the Royal Opera House in Covent Garden. The Marchioness did not possess a tremendous sensitivity or appreciation for music. In fact as the writer, E. F. Benson, laughingly remarked, she would have appreciated a Beethoven symphony so much more if she had been a personal friend of the composer. What Gladys most admired about the opera was that it was an opportunity for the rich and titled to get together for a full blown evening of pageantry. She was a natural entrepreneur, as the account books for the opera house testified over the coming years, and so she made a huge success out of promoting a night at the opera. The music itself was incidental, as long as it was superbly performed by the best musicians and the greatest singers of the day. It was the drama, the lavish sets and the splendid sense of occasion that truly appealed to Lady Ripon and probably to most of society. In one season she revitalized the half empty opera house and, with the help of her friend Sir Thomas Beecham, made it one of the main events of the London season, second only to Royal Ascot and Cowes week. Even Edward VII, notorious for his love of music hall tunes and female comedy turns like Little Titch, was a dedicated fan. He might not have been present for the entire performance when he attended an opening night; usually disappearing during the intermezzo for a twelve course dinner and baccarat. But faultlessly dressed; accompanied by beautiful women with cascades of diamonds covering their ample, snowy décolleté; and his rich and influential banker friends he took center stage in the royal box, a prominent and enthusiastic opera-goer. Having rescued the opera from financial ruin and promoted the success of one of its super-stars Nellie Melba for many seasons, Lady Ripon suddenly found herself at a loose end. She was stuck, bored and in need of a new ‘stunt’ as she liked to call it. And it was at this point that she contributed her piece de resistance to both Covent Garden, the London season of 1911 and the coronation of Britain’s new King and Emperor, George V.
It was the exotic and rather flamboyant Ballet Russe, discovered by Lady Ripon and invited to London that summer to perform in front of the new king and queen on the evening before the coronation, which swept society off its feet that year. Lady Ripon organized a truly gala event. None of the illustrious company gathered together at the Royal Opera House that evening was quite prepared for the spectacle that was the Russian Ballet and Vaslav Nijinsky. Thousands of roses decorated the tiers of the boxes in which the audience sat dazzled by the magnificent sets and vivid costumes, and then Nijinsky leapt onto the stage, wearing only a tight, skin-colored silk tricot onto which were sewn hundreds of pink and red silk petals for his performance of Spectre de la Rose. For once it was the actual performance that enthralled. Nijinsky’s magnificent, soaring leaps were so electrifying that women were reduced to tears at the sight of the Russian dancer. Up until the arrival of the Ballet Russe, ballet had been a rather half hearted spectacle, there was no choreography to speak of, and as one critic put it ‘just uneven lines of scruffy little girls in fluffy skirts and block shoes barely keeping up with the music as the entire corps de ballet scanned the audience for wealthy admirers.’ the Russian ballet started a new fashion of Bakst inspired vibrant colors, and it became awfully chic to lounge around in scarlet and pink chiffon Turkish trousers in a boudoir made over to look like an Ottoman seraglio. Ballet would never be the same again and it was the remarkably clever and glamorous Marchioness of Ripon who had so resourcefully had a hand in its change.